Open up the Render panel if you want to save out the current UV layout to a tiff image file. This file could then be used as a template for texture painting. Tick this to smooth out the jaggies in the saved image, though this slows down the creation of the file quite a bit. Tick this to include the flattened color coding in the image. Add an alpha channel to the output image, where all lines are solid, the background is clear, and filled polys use the gray-scale equivalent of their currently displayed color. Enter a value here to draw a grid behind the flattened geometry. This can be useful to register a printed or projected pattern to a measurement in the real world. Switch this to On to get a slightly thicker line around the shell boundaries, or to Only to show only the shell boundary edges. Ticking this option will render out the UVs according to Renderman's UV smoothing rules. Note: This currently only works for quads, and displays lines only (i.e. the quads aren't filled). If you are using the flattened geometry as a pattern for folding real shapes, then ticking this option will indicate the valley folders with a dashed line. Tick this and the rendered images for each tile are cropped to the visible polygons, with the specified pixel border added. Alternatively, if you set the border to a value of "a", then the tile is cropped to a portrait A sized paper aspect ratio. Click on Save to save the current UV layout into a tiff file with the specified base name; the default is layout.tif. Change this if you want a different base name to the tiff file created. Set the pixel resolution for the tiff file here. Once created, the image is displayed; you can then use File|Save or Ctrl-S to save it to a different location if you wish, using a ".tif" or ".jpg" filename extension to select the format of the saved image. The Repaint tool allows you to load an old mesh and texture map into UVLayout where you can then modify the UVs (e.g. repack, optimize, modify seams) and then repaint the old map according to the new UVs. To use, the modified mesh with new UVs should be loaded into the 3D window. Select the file (OBJ or UVL) with the original UVs. Select the original texture map file. 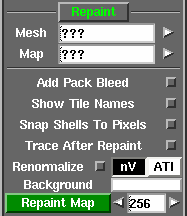 Tick this if you want to check that you have the tiled map naming parameters set properly before repainting. The decoded name for each tile will be previewed in the UV view of the graphics window. Tick this if you want to move the current shells so they're locked to the pixel locations; this is needed for lossless copying of shells that have been translated or rotated by 90 degree steps only. You should save your mesh out after running the repaint, because the UVs will have been modified slightly if you have ticked this option. The newly repainted texture map is mapped onto the loaded mesh, just as if you'd used the Display Trace tool. If the map being repainted is a texture space normal map, tick this and the normals will be adjusted for shells that have been rotated. The nV option selects nVIDIA style normal maps, and use ATI for maps with an inverted G channel. Its safe to leave Renormalize on for standard color maps because UVLayout will only adjust the color values if it detects that a normal map is being processed. After repainting, shell boundaries are bled out the set number of pixels. This helps make the UV seams less visible when the repainted map is used as a texture. Set the output resolution, then click this to create the repainted map. If these multiple maps are different resolutions, and you want the repainted maps to keep the same resolutions, then change the output resolution field to the equals character (i.e. =). You can also enter in a resolution multiplier (e.g. *2) or divider (e.g. /4), and then the resolutions of the output maps are adjusted accordingly. ... then that file is selected for the Map value. UVLayout will then replace the UU and VV tags with their actual values when trying to find the texture map files for polygons in those tiles. ... and selected that file for the Map value. UVLayout will then replace the #### with the tile number. 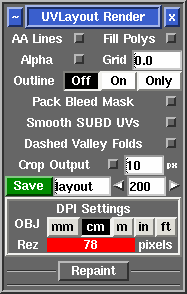 By default, UVLayout will examine the UVs in the original mesh to determine the maximum U index, but many people use "10". If that's you too, make sure you change the Max U value to "10" before repainting. This page was last modified 6 July 2017.